The older I get, the more I find myself appreciating older stuff. One of those things is an old Latin phrase In necessariis unitas, in dubiis libertas, in omnibus caritas which means "unity in necessary things; liberty in doubtful things; charity in all things." 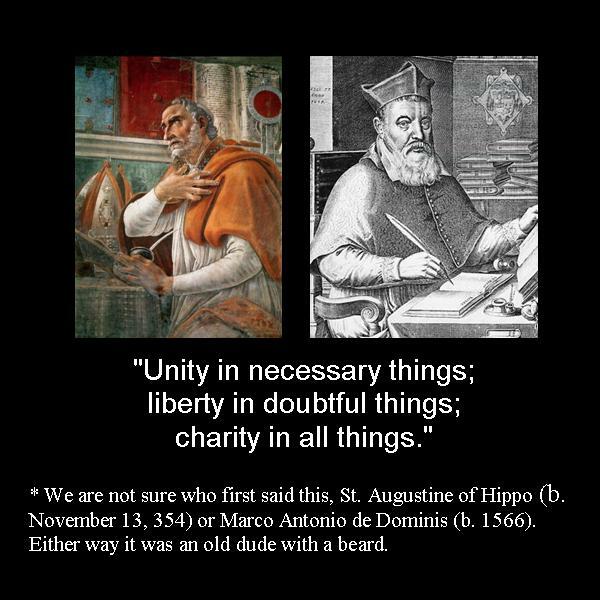 It is often misattributed to St. Augustine of Hippo (354-430), but seems to have been first used in the 17th century by the Archbishop of Split (Spalato) Marco Antonio de Dominis (1560-1624), No matter its origin, this saying is a beautiful way of describing how we operate at The Fuller Center for Housing. Our local leadership teams, which we call “covenant partners,” are unashamedly Christian. We don’t take government funds or the people’s tax dollars to build houses. And since the Bible says don’t charge the poor interest, we don’t. These essentials appear to be so simple, but ever since Clarence Jordan dreamed up the ideas of “Partnership Housing” and “The Fund for Humanity” well-intended people have tried to blur the line between the essential and liberty. Millard Fuller would often coach us to stick to the basics and to not get distracted by other program opportunities. This doesn’t mean we can’t collaborate with great programs in the neighborhood, but experience has taught us that staying focused is the real trademark of the successful entrepreneur. Another common error is that we see folks slipping into the type of charity that becomes a handout and skips creating the opportunity for the recipients to participate in the greater blessing of becoming contributors. Unfortunately, we are seeing more and more well-intended funding programs that prohibit nonprofits from requiring a payback. As tempting as it is to chase after easy money for our programs, by not requiring a payback, we are shortchanging the Fund for Humanity and thus the benefit of recycling the money in the community that helps us help other people in need. A couple years ago, we were planning projects for our annual Faith in Action weekend where several area churches all work on multiple projects. I visited an older couple that had called our office to apply for some help replacing some damaged wood siding. As I was interviewing them, I learned that their house was one of the original Partnership Houses built by Millard and Linda Fuller’s efforts before they launched Habitat for Humanity. While reviewing their budget, I asked them how much their monthly mortgage was and they smiled as they shared that six years earlier they had paid it off completely. I remember what it is like not having any income. The first four years that we started our project in West Virginia, I wasn’t paid at all. It was painfully awkward to sit in church as the collection plate was passed and I dreaded with a passion our annual stewardship campaigns because I couldn’t make a pledge to something I cared very deeply about. Let’s not get into the habit of shortchanging the repayment system that turns our recipients into contributors. There’s another thing that happens when service providers don’t require repayment. Ongoing family support is not essential after the transaction takes place or in our case the construction project is complete. 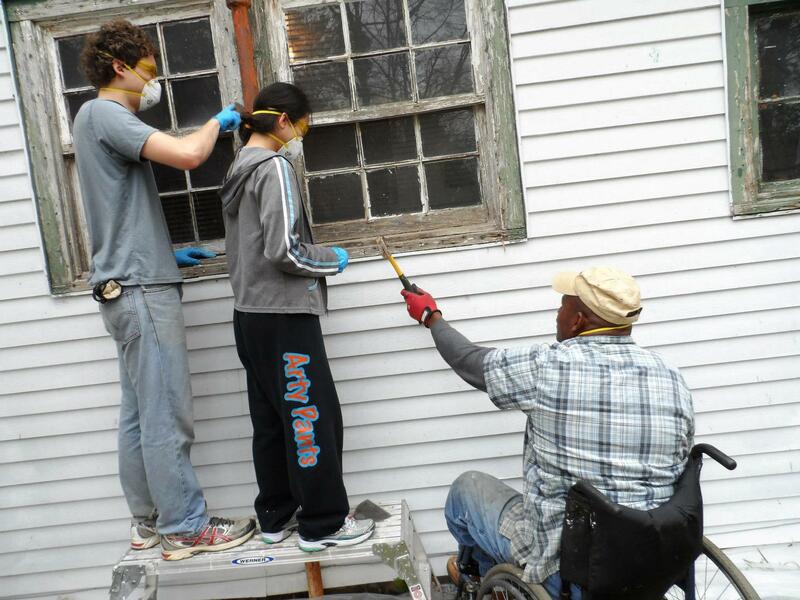 This week we have some great students from the University of Cincinnati working on a home on Davenport Street in Americus. Our office sits on the corner of Davenport and Martin Luther King, Jr. Boulevard. This morning at devotions, our president David Snell pointed out that lots of folks pass our headquarters on MLK. But most people in town and certainly the people passing through on their way from Atlanta to Tallahassee never have a reason to go down Davenport Street. To put it simply, the houses on that street are old and the folks are struggling financially. Collecting payments will require that we have to go down Davenport often and thus we will stay in a relationship with the families. This is a blessing we want to continue to have. Many people love how Eugene Peterson translated John 1: 14 in The Message: “The Word became flesh and blood, and moved into the neighborhood.” Notice he didn’t suggest that God passed by the neighborhood. He actually moved in. We try to be that type of messenger at The Fuller Center. This is the best way to demonstrate that we are sticking with the essentials.